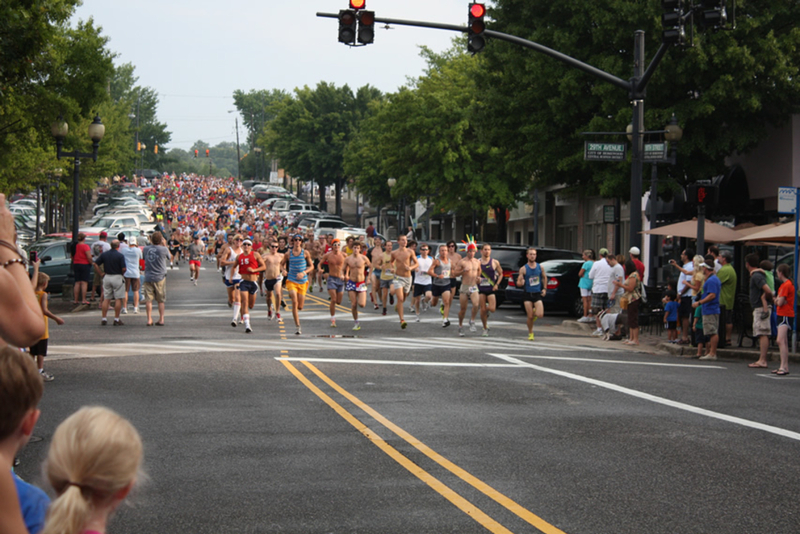 Every Wednesday, the Trak Shak hosts a 5-mile social run through the residential Homewood neighborhood. Join about 40-50 other like-minded runners for this fun Hump Day celebration. Five miles, 37 feet of elevation, a water stop, and a post-run beer with pork rinds: it’s the weekly ritual of the Trak Shak, a social run that starts at the shop and winds through Homewood, a kid-filled neighborhood of 1950's cottages. You’re certain to find a group of runners with similar aspirations (“I will crush this run at a 5:30 pace” or “Let’s get this over with in order to get back for the beer and rinds”). Whatever your goals are, if you show up about 5:25 p.m. on a Wednesday and talk with some of the 40-50 odd runners getting ready to head out, you’ll find the appropriate group to run with. At this weekly training run, where “all paces are welcome”, there’s very little traffic, a water stop at the 2.5 mile mark, and Southern-style snacks and libations upon your return. 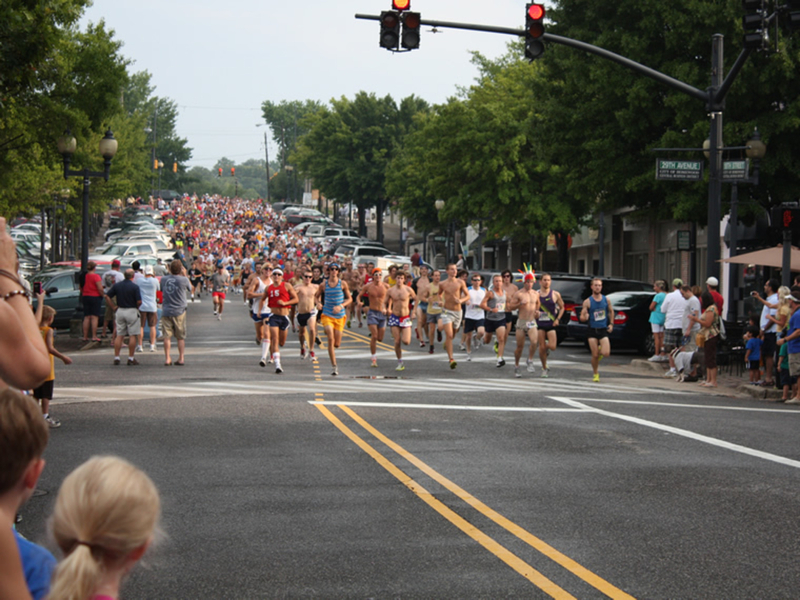 The course is easy to follow on your own, with 3-mile and 8.5-mile options. The only dicey part of this route is that it runs right behind Dawson Church, a sprawling campus affectionately nicknamed “The Church that ate Homewood.” If your run coincides with services letting out (because the run starts at 5:30, this is not unlikely), prepare to dodge police-directed traffic for a couple hundred yards. Other than that, this is one of the nicest urban runs in the area. You’ll find plenty of food options within a cool-down walk from the Trak Shak. Our favorite? Hand-crafted margaritas, small-batch fresh guacamole, and smoked brisket tacos on hand-pressed tortillas on the patio of The Little Donkey, a local haven where everything on the menu is “Hecho en Homewood.” It’s right next to Octane Coffee and Steel City Pops, where the inventive flavors—Tupelo honey, clementine, sweet tea—are truly worth the price. Both are about 2.5 blocks to the west of the Trak Shak. This is the perfect run to do either with the Wednesday group, or solo, especially if you are training for a 5K, 10K, or just trying to beat your last time. Running with other folks can challenge you and propel you forward when you are tempted to slow down. Fellow runners with the same goal in mind (“please don’t let me finish last this time…”) can encourage you to do better when you would otherwise give up. However, if you prefer to fly solo, you can still run this same route on your own at any time. The Homewood Trak Shak is easy to find. There’s plenty of parking in the downtown area of Homewood, and you’ll love the quaint surroundings. From HWY 31, turn onto 29th Ave S/Independence Plaza and you’ll see the Trak Shak on your right on 18th Street S. This is a free event open to the public. While you’re there, peruse the shop and take a look at Trak Shak’s incredible variety of gear.